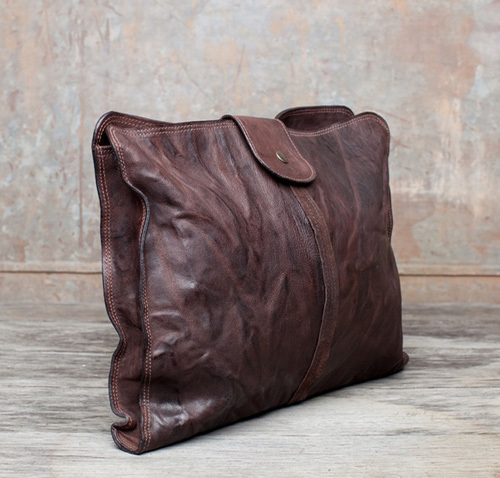 Peter Nappi is an Italian handmade shoe company based in Nashville, Tennessee, which so happens to also make stunning leather bags and dry goods. The shop continues the family legacy of Peter Nappi, who was born in Italy in 1887 and learned the craft of boot making before immigrating to the United States at the turn of the Twentieth Century. As Dana Nappi recently shared with me, "Our small, limited edition batches feature individual attritubes not available with mass production. The leather is of the highest quality and allows each item to have their own unique character." The lovely pieces above are the Weekender and the Messenger. This drool worthy laptop sleeve fits up to 15" laptops and it's the kind of bag that makes me love the person who carries it. Isn't it just crazy perfect? In accordance with tradition, the Peter Nappi brand is known for their beautifully made shoes. As Dana shared, "Our design inspiration comes from turn of the century work boots- designs reminiscent of generations past, rich with tradition and timelessness." This model is the Stefano, constructed with just one piece of leather. Grandson to the late Peter, Phillip Nappi is behind all of the boot designs. 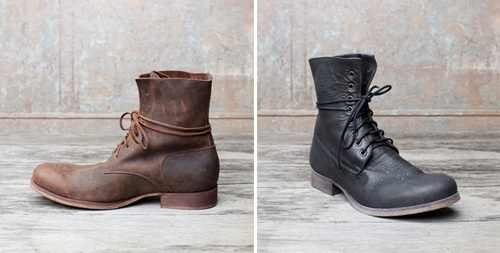 The Julius, to the left, is the first boot they offered as well as their current best seller. Phillip was inspired by a pair of work boots he wore for years that were comfortable, functional and well designed. When they were worn to the ground, he looked for a replacement and came up empty. As Dana shared, "He set off to recreate a pair of 'go to' boots right out of the box." To the right is the sturdy and casual Bartolomeo, which features double line stitching with 12 stitches per inch. They refer to this one as "the wonder of craftsmanship." Called the Romeo, it is made with just one piece of leather and touted as being "uniquely comfortable." My nephew Cameron would love these distressed leather cuffs. To the left is the curved version, to the right, the snap cuff. And as much as I love a good shoe on a man, the same goes for his wrist watch. These vintage inspired pieces that are battery operated are just so unique and just, I don't know, cool. I want all men to have a watch like this... To the left is the Deco, to the right you'll find the Ancient. And come to think of it, a great belt on a man is so good too. At Peter Nappi, they offer a wide and narrow version in black or brown. The one above is their wide belt, made with a double tongue, antique brass buckle. And just because I couldn't help it, I included another bag, the Claudia Tote. This can easily work for men or women and comes in either a zipper or snap version.